Halakist; lived toward the end of the tenth century. Rapoport assumes him to have beena Palestinian, but it is more probable that he lived in Kairwan. He was the author of a work, now lost, in which, as its name "Sefer ha-Miẓwot" indicates, the 613 commandments were enumerated (see Commandments, The, 613). Unlike his predecessors in this field, Ḥefeẓ, besides an enumeration of the laws, gave, in brief, reasons for their existence. He was thus, perhaps, the first in the field of the "Ṭa'ame ha-Miẓwot," which afterward had so many exponents. Moreover, the "Sefer ha-Miẓwot" contained not only the Biblical ordinances, but also their Talmudic-rabbinical amplifications and interpretations. Ḥefeẓ gave what may be described as a brief summary of Biblical, Talmudic, and geonic literature, including also formulas for prayer. The book was highly esteemed by the Spanish and German-French authorities, and the decisions of its author, who was referred to as "Gaon," "Resh Kallah," and "Alluf," had such authority that even Maimonides acknowledged himself under obligation to him (comp. his responsum in "Pe'er ha-Dor," No. 140). Ḥefeẓ was a grammarian and a philosopher as well as a halakist, and, what is very remarkable, he managed to express his philological and philosophical opinions even in his "Sefer ha-Miẓwot." 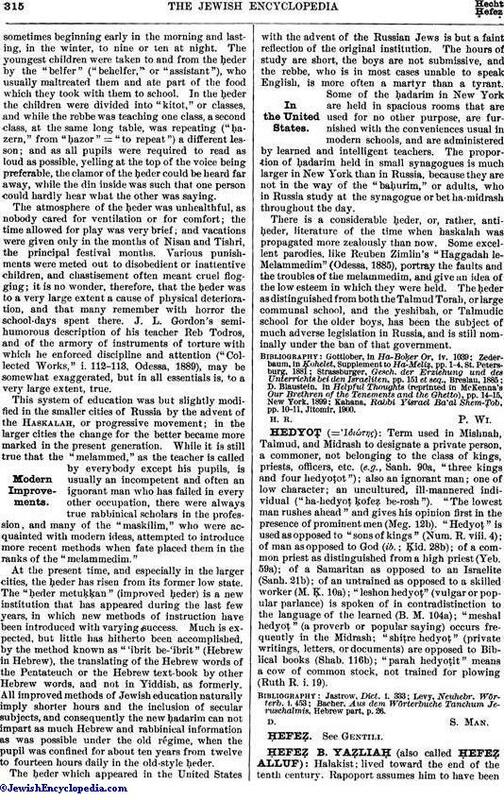 Jonah ibn Janaḥ, Judah ibn Balaam, Solomon Parḥon, and Tanḥum Yerushalmi quote grammatical as well as lexicographical remarks from Ḥefeẓ's "Sefer ha-Miẓwot." 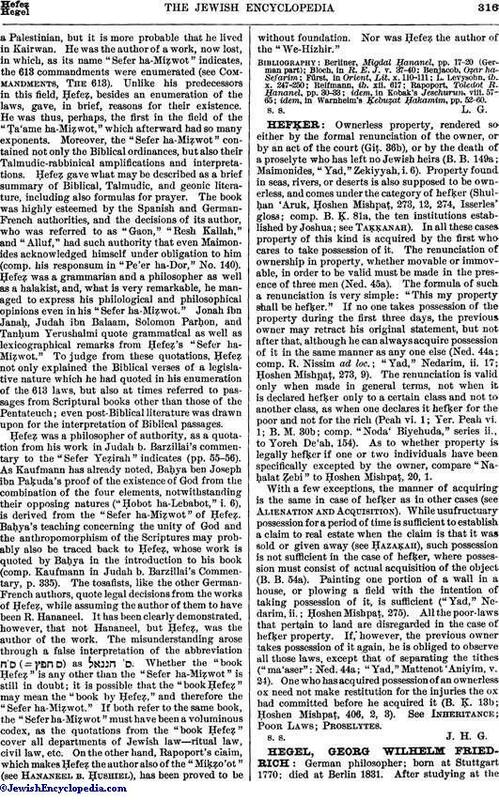 To judge from these quotations, Ḥefeẓ not only explained the Biblical verses of a legislative nature which he had quoted in his enumeration of the 613 laws, but also at times referred to passages from Scriptural books other than those of the Pentateuch; even post-Biblical literature was drawn upon for the interpretation of Biblical passages. Ḥefeẓ was a philosopher of authority, as a quotation from his work in Judah b. Barzillai's commentary to the "Sefer Yeẓirah" indicates (pp. 55-56). As Kaufmann has already noted, Baḥya ben Joseph ibn Paḳuda's proof of the existence of God from the combination of the four elements, notwithstanding their opposing natures ("Ḥobot ha-Lebabot," i. 6), is derived from the "Sefer ha-Miẓwot" of Ḥefeẓ. Baḥya's teaching concerning the unity of God and the anthropomorphism of the Scriptures may probably also be traced back to Ḥefeẓ, whose work is quoted by Baḥya in the introduction to his book (comp. Kaufmann in Judah b. Barzillai's Commentary, p. 335). The tosafists, like the other German-French authors, quote legal decisions from the works of Ḥefeẓ, while assuming the author of them to have been R. Hananeel. It has been clearly demonstrated, however, that not Hananeel, but Ḥefeẓ, was the author of the work. The misunderstanding arose through a false interpretation of the abbreviation ) as . Whether the "book Ḥefeẓ" is any other than the "Sefer ha-Miẓwot" is still in doubt; it is possible that the "book Ḥefeẓ" may mean the "book by Ḥefeẓ," and therefore the "Sefer ha-Miẓwot." If both refer to the same book, the "Sefer ha-Miẓwot" must have been a voluminous codex, as the quotations from the "book Ḥefeẓ" cover all departments of Jewish law—ritual law, civil law, etc. On the other hand, Rapoport's claim, which makes Ḥefeẓ the author also of the "Miḳẓo'ot" (see Hananeel b. Ḥushiel), has been proved to be without foundation. Nor was Ḥefeẓ the author of the "We-Hizhir." idem, in Warnheim's Ḳebuẓat Ḥakamim, pp. 52-60.